Area rugs are a terrific alternative to wall-to-wall carpet, namely because they're easier to remove and clean. They're also less of a commitment, and it's easy to switch one out if you get bored or want to redecorate. When it comes to using area rugs in your home, there are some important rules to remember. Before buying, check out these area rug do's and don't. When selecting an area rug, make sure that it extends under all the key pieces of furniture in the room. In a living room, for instance, all of the furniture should be on top of the rug. If this isn't possible, it's okay to have the front legs of major upholstered pieces on the rug and the back legs off. However, all the legs of smaller pieces should be on the rug. In a dining room, the rug should be large enough for the chairs as well as the table. A good rule to follow is that the chairs should be on the rug, even when they're pulled out from the table. The number one mistake people make when decorating with area rugs is getting ones that are too small. This is understandable, especially when you see the price tags for some of the larger rugs. However, going big now will save you from replacing one that doesn't work later. Besides, the cost of a rug is still lower than an entire room of carpet. What good is an area rug if it doesn't extend beyond the bed? You'll end up stepping out onto a cold, hard floor in the morning, rather than a soft rug. Be sure to get your measurements right before you go shopping. Ideally, the rug should be large enough to extend beyond the sides of the bed at least 12 inches for a twin or double bed, and at least 18 inches for a queen or king. You can go bigger, but these numbers should be the minimums you want to look for. Make sure that any heavily trafficked areas are fully covered by the rug you choose. When people are walking through, they shouldn't have one foot on the rug and one foot off. It's awkward, uncomfortable, and can lead to unusual wear patterns on both the rug and your flooring. 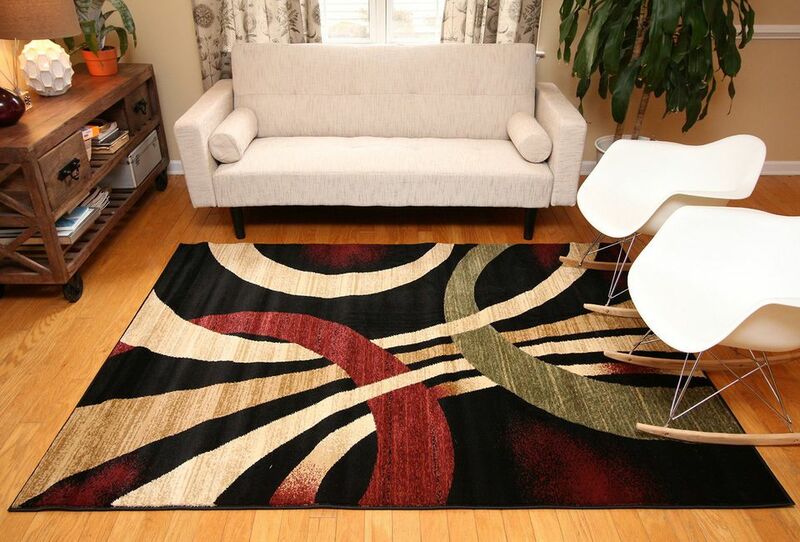 Area rugs are a great way to inject playfulness and fun into the room, so embrace color and pattern while shopping. There are many inexpensive options available, so if you decide you don't like it after a couple of years, it's easy to change. Be sure to check the cleaning instructions on any rug before you buy it. Sisal, jute, and other natural fiber rugs are inexpensive, but they can't be cleaned so you might have to replace them if there's a big spill. Weigh your budget and your options before buying. While it's tempting to place your best rug in a focal point of the house, such as your dining room, you might want to think twice about it. It's best to avoid placing expensive area rugs in areas where there are likely to be spills and accidents. Even though they're easier to clean than broadloom carpet, it can still be difficult to remove stains from rugs. Keep this in mind, especially if you have children and pets. You can't always control what your family does over the rug, so it may be best to go with inexpensive, easy-to-clean options in the more hazardous areas of your home.